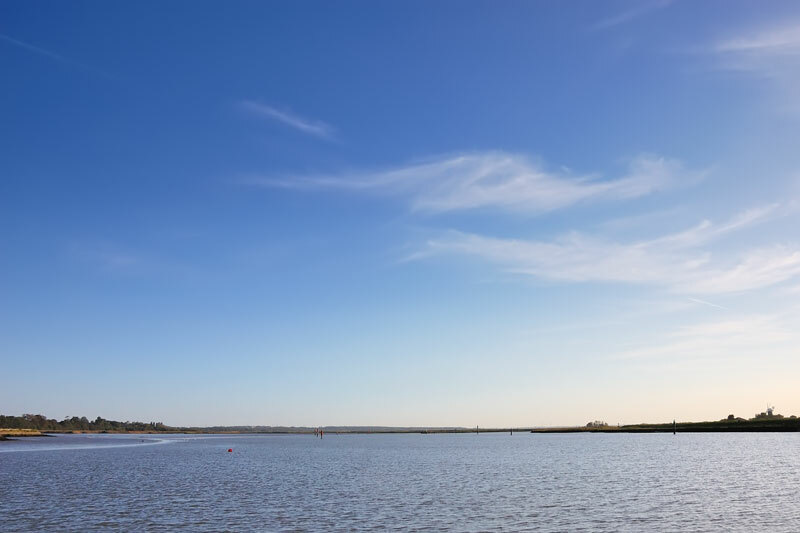 This section of the Yare is characterised by the vast skies over Breydon Water with views down to the Port of Yarmouth and beyond to the Scroby Sands Wind Farm. Breydon Water is all that’s left of a vast estuary that would once have stretched to Acle and beyond. The mudflats at low tide are popular with wading birds and other wildfowl. Keep to the marked channel through Berney Arms. 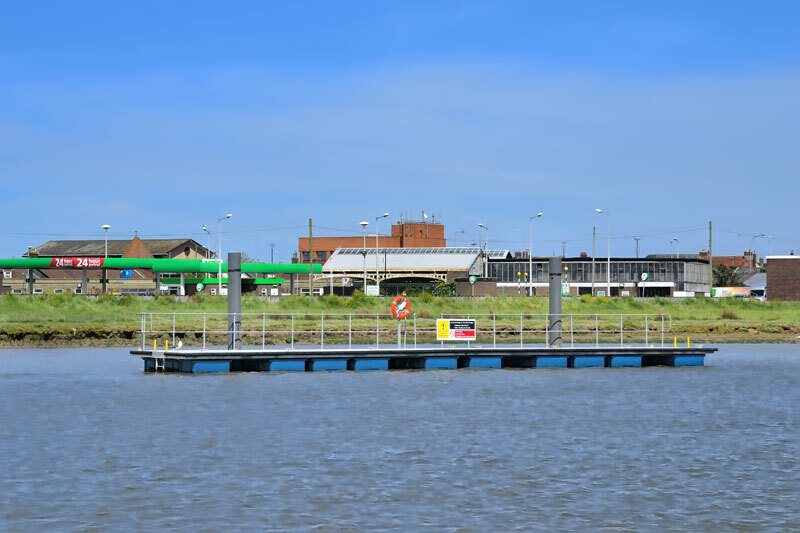 Turn right around the turn-tide jetty for the River Waveney and left for Breydon Water, but do not cut the corner. 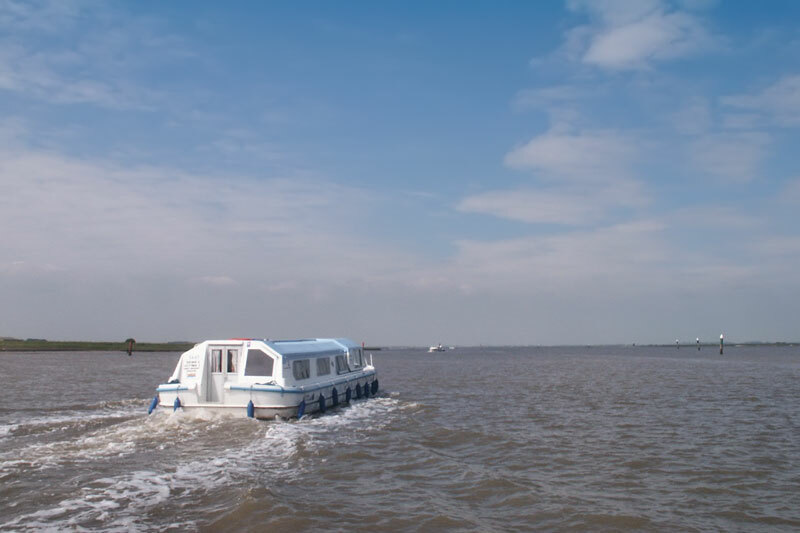 At almost 4 miles long and a mile wide Breydon Water is subject to a wide tidal range and flow. 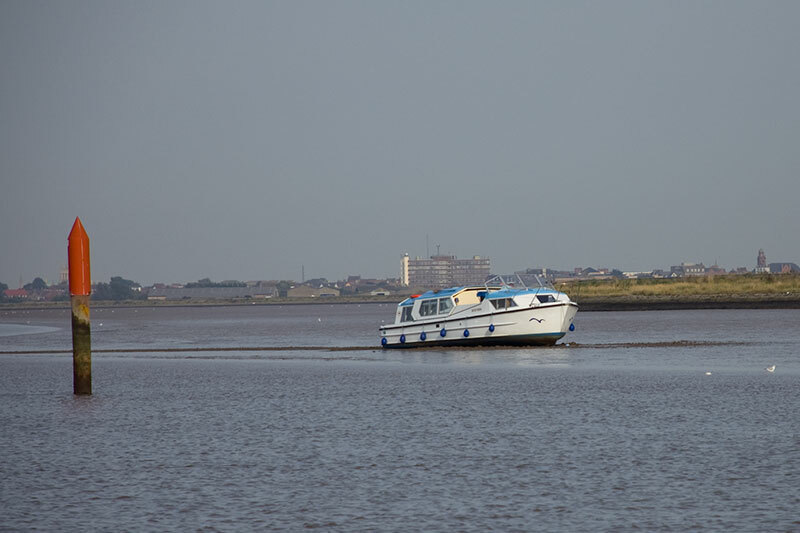 For this reason it is best crossed at low water, aiming to arrive at Great Yarmouth at slack water. This also ensures enough headroom (7 ft) at the two low bridges at the mouth of the River Bure. Even so when wind and tide are in opposition crossing Breydon Water can be like going out to sea with waves reaching over 2-3 feet! If in doubt about the weather conditions check with Great Yarmouth Yacht Station 01493 842794, do not attempt to cross Breydon Water in fog. At low tide the estuary outside the main channel is very shallow with extensive mud flats on both sides. 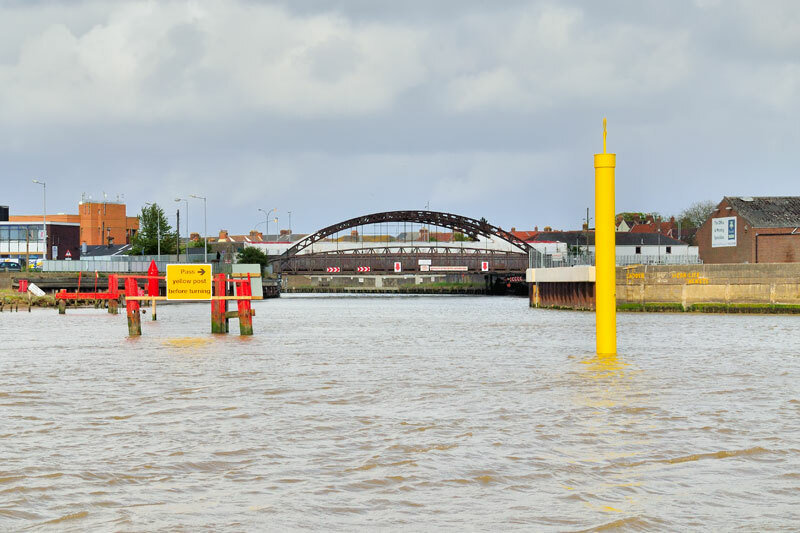 Keep the green marker posts to your left and the red to your right when crossing from Berney Arms to Great Yarmouth. If you stray outside the marked channel you will run aground. Each year a number of boats stray outside this marked channel and run aground on the mud and have to be rescued by a tug boat. Breydon Water is a large sheltered inland tidal estuary stretching from Berney Arms in the west to Great Yarmouth in the east. 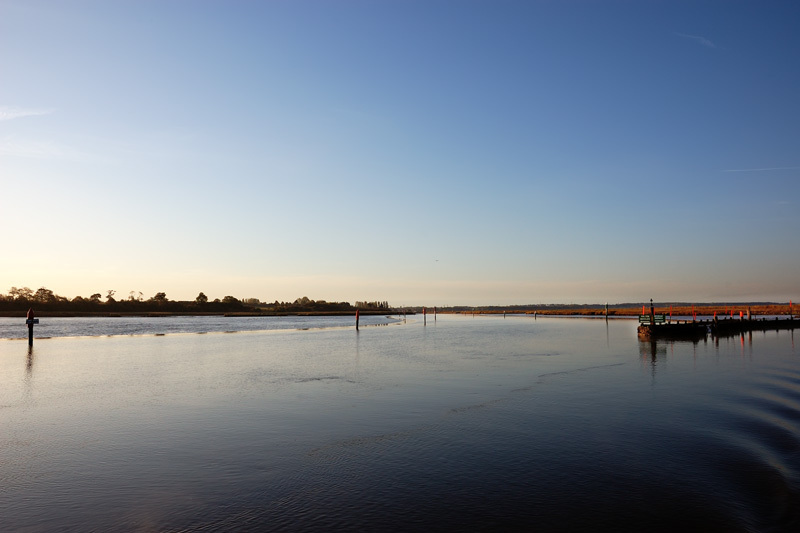 Although Breydon Water covers a large area, outside the main channel it is very shallow with extensive mud flats on both sides. 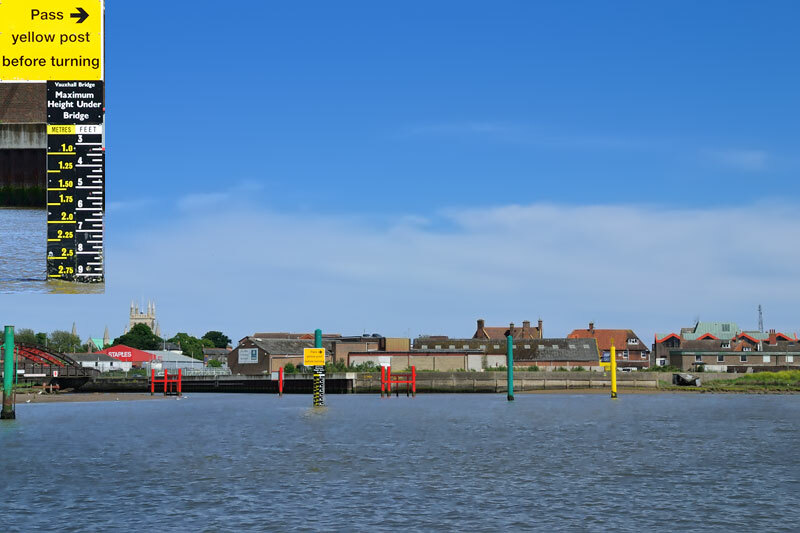 The area is characterised by its big skies with views across Halvergate Marshes to Stracey Arms Mill on the River Bure and down to the Port of Great Yarmouth. For naturalists it’s one of the most important estuaries on the east coast. It is a RSBP national nature reserve and designated by the European Union as a (SPA) Special Protection Area. The peak season for birds is during the winter when nearly 100,000 birds over winter here including Golden Plover, Hen Harrier and Widgeon. Two footpaths run around the edge of Breydon Water, to the north is the Wherryman’s Way and to the south Angles Way. Unfortunately there is no provision to link the two to complete a circular walk, as there is no ferry crossing. The best option would be to take the train either to or from Berney Arms and walk along the Wherryman’s Way, a distance of 5 ½ miles. On approaching Breydon Bridge keep to the right and pass beneath the side span marked with the two red arrows. 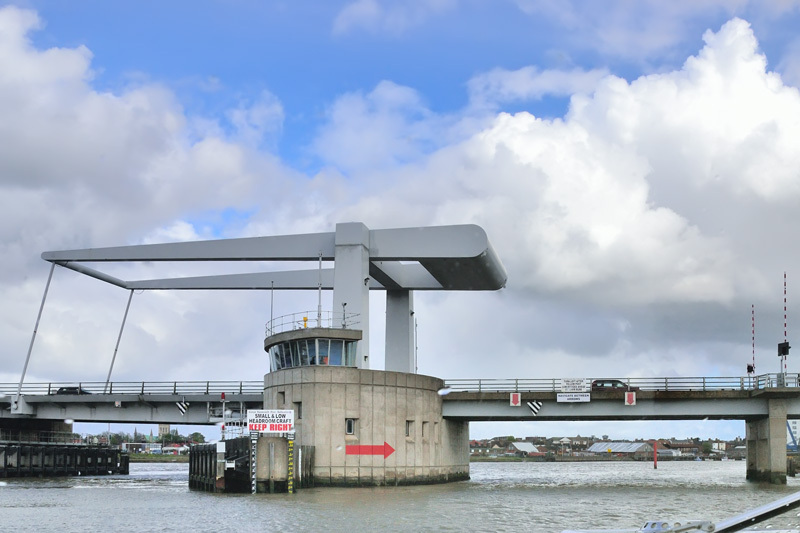 Yarmouth has strong currents and two low bridges with 6 ft 9 in and 7 ft headroom respectively at average high water. 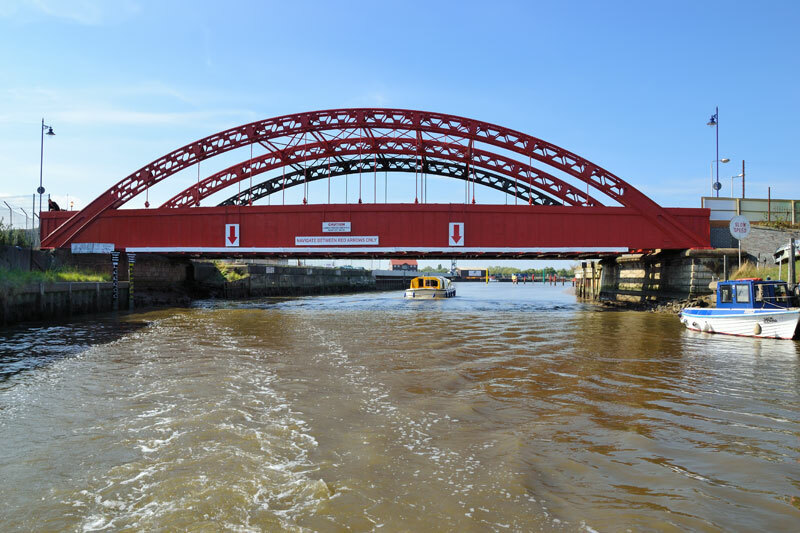 The best time to arrive is slack water or a little after, this is 1 to 1 ½ hours after low water you will then have maximum headroom at the bridges and the flooding tide to carry you up the River Bure. If there is an onshore wind, low water could be delayed, to check ring the Yacht Station on 01493 842794. 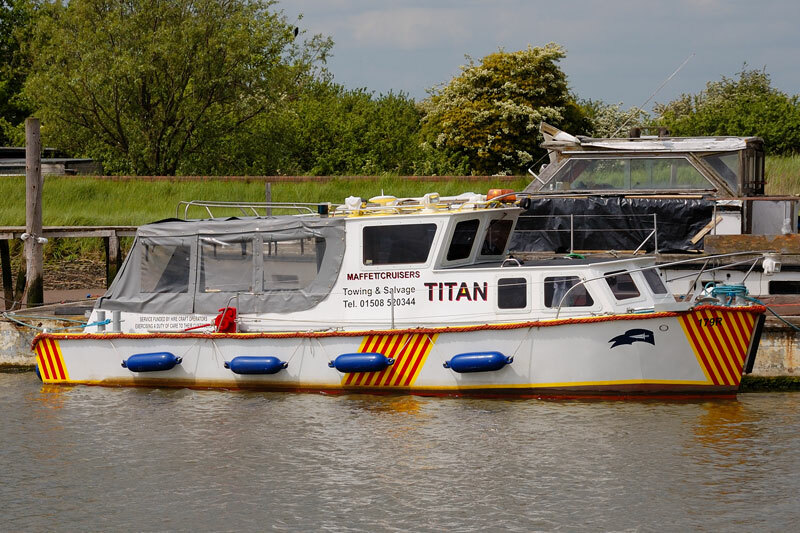 If you’ve timed your arrival at Yarmouth correctly then you should have no difficulty in turning to go up the River Bure. If your air draft is not sufficent to pass under the bridges the Broads Authority have provided a lay-by pontoon mooring downstream of Breydon Bridge. There is a height gauge before the bridges so you can check headroom. Turn after the yellow dolphin (post) being mindful of boats coming down the Bure. As you turn to go up the River Bure you may find the tide is still ebbing. Make sure you turn for the Bure in good time. This will then ensure you’re not pushed downstream by the outgoing tide. 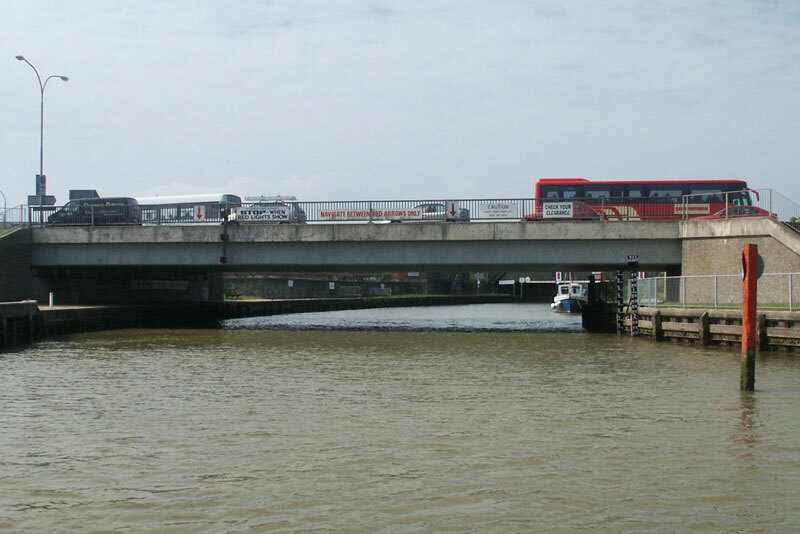 The first bridge is the old Vauxhall rail bridge, the second Yarmouth/Acle road bridge. Yarmouth grew around the harbour, as it was once a great herring fishing port. The fleet has dwindled over the years and now the harbour is busy with coasters, North Sea gas/oil rig supply ships and frozen food packaging services. 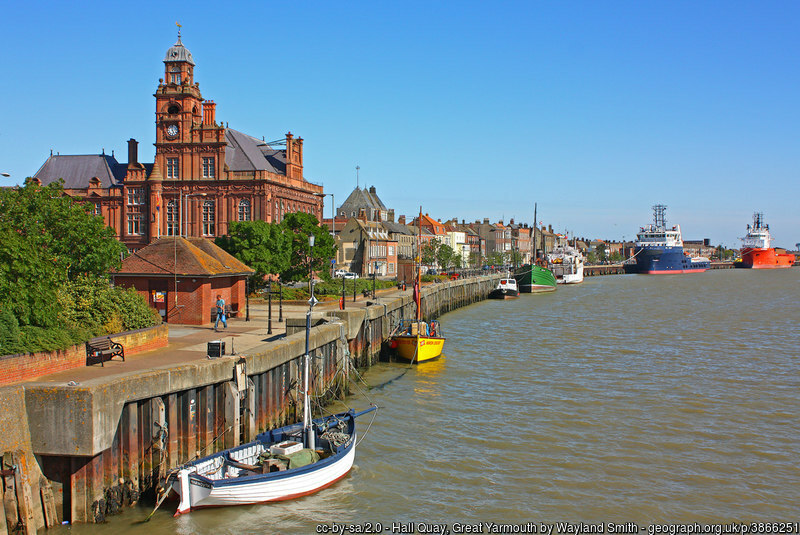 Although the old town was heavily bombed during WW2 much of interest still remains, including The Old Merchants House on the ‘rows’ and the Custom House on South Quay. It was in the 18th century that Yarmouth became popular as a tourist destination, and now tourism is the main industry. On its long promenade, Yarmouth has two piers a leisure centre, arcades and illuminations – a traditional seaside resort, with attractions to suit all.